We’ve introduced better chain-up regulations for commercial vehicles, which will provide more clarity for professional drivers this winter. That means safer roads, too. The changes come in the wake of one of our worst winters for highway closures. Unprepared commercial trucks caused 41 highway closures because they were either poorly equipped or totally unequipped with chains. In some cases, this was due to the driver’s inability to install the chains properly. Loss of traction in winter conditions leads to collisions and commercial vehicles simply spinning out on hills and blocking all lanes until they can be towed. The old regulations were not as thorough, requiring vehicles over 27,000 kilograms to carry and use chains or other traction devices, with only one wheel needing a traction device during winter conditions and mandatory chain-ups. Professional drivers properly equipped were often delayed due to these closures. The new rules clearly spell out safe chain-up configurations for all commercial vehicles over 5,000 kilograms. Two outside drive tires must be chained for trucks with one, two, or three rear axles. If the truck has more than one rear drive axle, we recommend the chains be installed on the rear drive axle closest to the front (as shown in graphics) because the front will chew up the compact and create a rough surface for the subsequent tires. Depending on weight distribution, some drivers may prefer to put them on the drive axle(s) closest to the rear. Four drive tires must be chained for trucks with one, two, or three rear axles. All four chains can go on one drive axle, or distributed to the outside tires of two drive axles. If more than one rear drive axle, we recommend chains be installed on the rear axle(s) closest to the front. Six drive tires should be chained: all four tires of the first drive axle, and the two outside tires of the second drive axle. Both tires of the first drive axle should be chained. Trucks with one drive axle must have both tires chained. Trucks with two or three drive axles must have all four tires on the first and second drive axles chained. Two outside drive tires must have traction devices for trucks with one or two drive axles. If more than one axle, we recommend the drive axle closest to the front be equipped. Two outside rear tires must have winter tires or traction devices. 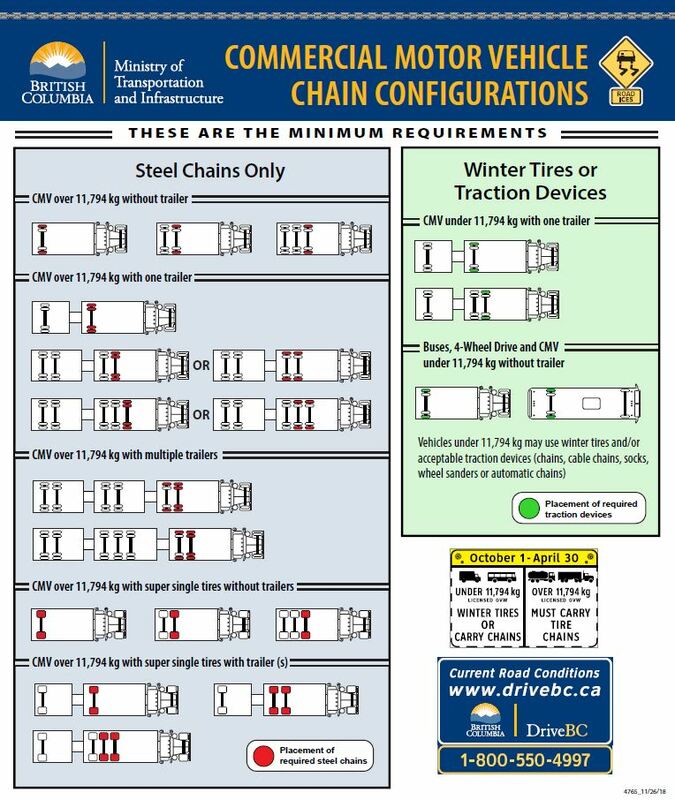 Motor coach buses travelling across BC’s mountain passes, regardless of LGVW (bigger and smaller than 11,794 kg) need either winter tires, or some sort of traction device such as: steel chains, cables, auto-socks etc. Now, we realize this is short notice for the trucking industry. That’s why CVSE officers will be educating commercial drivers over the coming months before implementing and enforcing stricter fines at a later date. We’re evaluating escalating fines for non-compliance; previously, not carrying chains or installing when required came with a set $121 fine. Over 70 per cent of commercial drivers surveyed approved of enhancements to the quality of, and requirements for, traction devices. Over 90 per cent said they are already compliant with the regulations. Over 80 per cent said they have the tools and training in place to implement the proposed regulations. Along with the stricter chain-up regulations, commercial vehicles are restricted from using the left lane northbound on the Coquihalla between Box Canyon and Zopkios. This is to prevent multiple spin-outs from closing the highway. In the event of a severe weather event, CVSE and traffic control will be directing commercial drivers to chain-up at the newly expanded Box Canyon Chain-up area. Of course, carrying chains is useless unless you know how to install them. Please make sure you hit the road with the knowledge and ability to follow the new chain-up regulations. Got a question? Ask us in the comments section below and we’ll be happy to help. Are emergency vehicles( Fire Trucks) exempt from having to carry chains? All of our Apparatus over 11,794 KG have insta-chains. If so can you please provide me the document. Like a lot of driver’s and fleet managers I was caught off guard with the new chain up regulations. I’ve driven all kinds of different trucks up through the interior highways in all kinds of conditions and have seen some very stupid people that have no business being up there. And I now look after a small fleet of trucks and drivers,and I go through the fleet every Sept.and make we have all the proper equipment needed to drive these roads. The are taught how to chain up and go through driver training before they are okayed to drive winter highways. I think we need better rules and training before any driver is aloud to drive into the mountain passes, just getting a commercial license does not make you a truck driver it takes time and experience. By all means give them a license but don’t let them into the hills until they prove themselves in the city first and not just for a month, new drivers have to put an ” N ” on their cars a class #1 driver is a new driver. We use different types of trucks for the type of work we do, we have 5 tons that I have been in deep snow with and never had to chain up until this year because of the new laws. Our trucks have new tires put on every Sept. and all trucks have chains on them, we have tri-axle straight trucks that haul trailers that I do agree with the chain up policies but the 5 tons I don’t agree. Thanks for taking the time to send us your feedback ledge – we appreciate hearing from you and hearing the due care and attention you put into managing your fleet. We have shared your concern forward with our engineers for review and will let you know what we hear back. if you cant don triples you are not a professional drover. …it reads “fines for con-compliance;” a typo. I have read all the questions and the responses. A couple of things stand out to me. 1. Time and time again it is stated by drivers that the maintenance of the snowshed hill, along wkth other stretches of hwy 5 are not adequately maintained during snow storms. The reponse is always the same, they are meeting the gov specifacations. Has it occurred to the gov fhat specs they are requiring are not sufficient to adequately maintain the roads. While I personally didnt drive the coq while the tolls were on. The one thing I have consistently heard from drivers is the ever dropping of maintenance of the coq. Cant imagine ALL older drivers would be saying if there wasnt some truth it. 2. In the beginning you said the gov received input from the driving industry. Can you please verify WHO in the trucking industry signed off on these regulations? I have yet to hear one professional driver agree the new process in place is better than the old. It would be helpful to know who helped create these rules. 3. You state on several occasions that 31 out of 35, or whatever the number was, that commercial vehicles were “involved” in the closure. What exactly does involved mean? I have been “involved” with every disagreement with my wife, but I can assure I was not the cause of all of them. How many closures occured soley based on commercial vehicles? Last year was a bad winter, how does this compare to other winters. Putting me in the mountain about 9, and the lights sufdently get turned off. It stopped snowing the evening before, but somehow, right at day break, you see the trucks rolling to clear the snow. Hwy 3 is exactly the same, at times I just follow right behind, its the first scraping, and its after 8. Especially when the snow hits in Sundays, they are never out sunday nights. 5. Scraping and leaving an inch or so. Why oh why do they do this without dropping sand? Please, for the love of god explain how scraping snow away, and leaving just enough to turn to ice right after a few vehicles drive over, with NO sand helps anything at all? 6. Lastly. Since you gave instigated the new throw the chain up lights on earlier and leave them on forever rule, the maintenqnce has gotten noticiably worse this year. For the little amount of snow we’ve had up there, I am shocked at just how long its taking them, and how poorly its done. We thought it was bad before, they are showing us a whole new level of bad. Makes ya wanna appreciate the crap jobs feom yesteryear. A: We consulted with the BCTA, and conducted an online survey for industry to share their comments/concerns. There was 70% to 90% agreement from survey respondents with our approach, depending on the various aspects of the regulation. Q: You state on several occasions that 31 out of 35, or whatever the number was, that commercial vehicles were “involved” in the closure. What exactly does involved mean? I have been “involved” with every disagreement with my wife, but I can assure I was not the cause of all of them. How many closures occured soley based on commercial vehicles? Last year was a bad winter, how does this compare to other winters. A: We recognize that not all of these incidents were caused by commercial vehicles; however, our Operations and CVSE staff from across the province have anecdotally noticed an increase in incidents that close the highway which involve a commercial vehicle. Do to the size and challenges associated with clearing a commercial vehicle from the highway, these closures are often the ones that lead to extended highway closures. We have statistics on vehicle collisions; however, we don’t have historic statistics on commercial vehicle related closures, it is something that we informally started tracking recently. A: All of our maintenance contractors staff full crews with coverage 24/7, and depending on the weather, they adjust crews accordingly. We have staff who regularly monitor the contractor’s activities and performance at all times of the day, night, and week. We hope that this helps answer your questions. Please let us know if you have any other questions or concerns. How many mandatory chain-up locations are there on BC highways? If I was to head to Kamloops from the coast while there was mandatory chain-up in effect could I travel via Hwy1 and then return via Hwy 5 and not have to worry about it? Here’s a link to more information and maps for each region of the province and what the chain up/winter tires route are within each. I have been driving for the last 20 years and have invested in auto socks for my truck as i have a lower back pain if i lift anything heavy. Triples are out of question as they are VERY HEAVY for me to lift and spread them over the axle as you have to lean into them with a Trailer hooked up. So after investing in socks (which were Legal and good), how can you change the rules and expect us to comply on a whim. How can you force us to lift Heavy Triples? If the truck you are driving is over 11,794kg, there won’t be any alternatives. Although we received a lot of feedback from our industry survey suggesting that triples are better than 4 single chains, we kept the option to chain with 4 single chains (single trailer configuration) for this reason. For anyone hauling b-train (2 trailer configurations), they will need to be able to install triple chains. I actually find this extremely troubling, especially since I have carried and used previously approved alternative traction devices. I always used the auto socks ever since I seen the testing video’s in Denver and Sweden. When you compare traction with ease of use I find they beat out chains, especially for someone with a bad lower back that can’t handle leaning over tires with a set of doubles. Or that runs equipment with rear fenders that doesn’t allow the use of 4 singles. I don’t see how it’s fair to punish everyone, when you yourself mentioned people weren’t putting chains on properly or not at all. That’s just a laziness issue that your now using to punish all of us. Like I said before I’ve used my Autosocks, I was stopped at the bottom of an ice covered hill, I put them on and locked my rear axle, put the truck in gear and not once did a single tire slip, I actually had to swerve around other spin outs or guys spinning out who threw chains, because chains don’t cover the entire tire surface. I think this was a poorly thought out decision, your issue was no one was making sure the chains were on, and done properly, so now you’re doing what I think should be illegal and changing the law after the season started and most of us already spent money to have our equipment ready to go, only to tell us we need to change what we are carrying. I’m not threatening anything, but don’t be surprised if you get lawsuits for changing a law without notice after it was in effect. Especially from guys who just like above. HAVE EQUIPMENT HARD MOUNTED TO THEIR TRUCKS AND CANNOT HAVE IT REMOVED CHEAPLY. Which leads me to my 1 question, is BC ever going to allow alternative devices again once they realise the issue was never the law, but the fact that guys were just lazily putting chains on, or not using them at all like your study said? Hello again Steve – thanks for your comments and we hear your frustration. We changed the regulations only for vehicles over 11, 794 kg. We made the requirements more rigid based on risk – heavier trucks have greater issues with loss of traction – not to mention higher consequences. Certainly we will be assessing the effectiveness of our changes, but we currently have no plans to change them in the near future. We hope that this helps answer some of your concerns. Sorry about the double reply, the way the comments updated made me think my first reply actually didn’t go through. I didn’t notice until this morning that they update ascending instead of descending. Unfortunately no your response doesn’t answer any of my concerns or change the fact that your regulation change is poorly executed and in my opinion, improperly researched when it comes down to what approved traction devices can be used. This rule would work much better if it allowed some approved alternatives with the stricter application guidelines, but obviously that was never a consideration. Hi again Steve. Sorry to hear about your issues with the notifications. We are working on updating this blog and its functionality in the next few months, so stay tuned for that. Regarding your comments about approved alternatives, we understand your frustration. While we want to make it easier for commercial drivers to chain up, we also need to consider the overall safety of the travelling public. Our traffic engineers are always open to learning about new developments in safety and carefully research their effectiveness in the unique conditions of BC Highways, which is why tire socks were included in the list of allowable traction devices previously, however; on review of their effectiveness were found to be lacking in traction at higher vehicle weights. If other devices become available, our engineers will assess their suitability. Please can you explain why you the mountain passes are now so poorly maintained. Last year I noticed that overnight the snow plows were no longer plowing to the road surface the blade was lifted about an inch leaving soft snow that was just compacted by the plows wheels thus turning to ice. since they were not clearing the road they did not put dirt down (dirt has no effect when buried by an inch of snow. The road was only maintained in the morning when the grader was used and dirt finally added to a surface that it could work on. I know this save a great deal on plow tips and sand, but not only does it but truckers at extra risk from deliberately creating ice it destroys the road surface, a half inch of ice is easily scraped away but is very difficult for chains to lift the truck onto if the driver is forced to stop, so as soon as a small depression is formed by a slipped chain the truck is now trying to dig itself out by clawing at ice and the road surface. if you look at the lower section of three mile on the kootenay pass you can see the effects very clearly. I assume you will say that that is not the practice but having been stuck on the kootenay pass several times last year and being out my cab when the plows go past and there was about an inch of soft snow left behind with nice sharp tire tracks. If you do not believe me please get someone from infrastructure to do a surprise overnight night inspection while it is snowing. Very often chains really are not required for many LTG loads, a few years ago I was able to climb the kootenay barefoot in 6-8 inches of fresh snow with just the power divider in (no dif locks required),(Experienced driver really do know what their trucks are capable of). Now however since they seem to deliberately turn the surface to thick ice I am reduced to destroying chains (and the road surface) and risking my life to put on unnecessary chains at the side of a really icy road (chain up areas are usually not cleared at night), just to increase the profit of the maintenance company. Hi D and thanks for your question. We have shared your comment with the local operations manager. Stay tuned for more info. Thank you for reaching out with your observations. Snow removal techniques depend largely on the weather being experienced. Often when there is heavy snowfall, maintenance vehicles will utilize their front plows. Front plows ride on ‘shoes’ that keep the plow lifted slightly to ensure safety for the operator. Graders and belly plows that have the ability to use a downward force to ‘scrape’ are also used but are most effective during the cleanup phase of a storm. The ability to get the road back to a bare condition largely depends on the ability to use anti ice chemical, road temperatures, air temperatures and the trend in the upcoming weather ( ie warming or cooling). Local staff they have confirmed, in reaching out to their patrols this winter, that the maintenance contractor has been running equipment 24/7 as needed and has generally been meeting with ministry specifications. Also of note, last year saw a record breaking amount of snowfall on Kootenay Pass. Given Kootenay Pass is the highest mountain pass in the province, winter season is long and challenging. It is important to consider that chain ups can often be required when winter maintenance is ongoing, again this largely depends on the current weather conditions. If you would like to discuss your observations further we recommend contacting the district office at 250-354-6400. There is a great deal of difference between slightly with added dirt and an inch with no dirt. truck driver travel long distances and pass countless plows it is not difficult to see and hear the difference. They may be complying with the ‘specifications’ during the day after the grader has passed but they are NOT during the night. Please get someone to actually look at what they are doing overnight (without giving them prior warning of a visit) and compare how long it takes them to fully open the pass (chain up signs turned off) after the snow has stopped, a few years ago an early evening snowfall of a few inches would be cleared withing a few hours, now it is unusual for the pass to reopen in under a day even if the snowfall is less than 8 inches. please also talk to some of the tanker and super B drivers and ask them what they think of the ‘specifications’ and how well they think the hill is being maintained. Very recently, I understand, a driver was almost killed by poor maintenance and these new rules, a car lost control on the icy surface and smashed into the side of his truck that was lined up along the road, it was just lucky he was working on the other side of his truck at the time. These new rules now force far more drivers to spend much more time in danger chaining up at the side of the very icy road because every truck now has to put on much more chain and there is nowhere near enough safe area for them to work just to compensate for the poor maintenance or to avoid being fined for being competent, (if they made it to the top of the hill without chains then they DID NOT NEED CHAINS). By all means fine those who actually cause a blockage but only if the maintenance at the time was up to ‘specifications’, if it was not then get the tax from the maintenance company not the driver. There has been a very noticeable increase in time after the snow has stopped that the chain up signs remains on. on average a 10% rise in snowfall should mean only 10% extra road closure and 10% more chain up sign, that is definitely not the case now. Please compared how long the road is closed now to before maintenance was sold to a for profit operation. Please could you publish the hours of closure (both fully and chain up required)compared to inches of snowfall per month over the last decade. I know each storm is different but year by year and month by month they should average out. Thank you for you comments about maintenance on the Coquihalla Highway, and new chainup regulations. The volumes and type of traffic travelling the Coquihalla Highway have changed over the last six to eight years. There are now thousands of commercial trucks driving the corridor daily, as well as passenger vehicles. Usage has increased exponentially. The increased number of trucks spinning out and requiring closure of the highways, has led to us increase the requirements for commercial vehicles to chain up, and to expand the Box Canyon Chainup facility to provide room for 70 vehicles. There has also been more snow. The Coquihalla Summit had a total snowfall of 830 centimetres from Oct. 1, 2017, to the end of February 2018 — 114% higher than the 10-year average. While the highway has an average of 21 full closures per winter, through January 2018, there were 35 closures, 31 of them involving commercial vehicles. Winter maintenance is a priority on all our highways, including the Coquihalla, to make sure that routes can be driven safely by both passenger vehicles and trucks. Ministry staff actively patrol our roads and highways to ensure the maintenance contractors are out in sufficient force and meet contract specifications. Senior ministry staff regularly audit contractor performance and work with them to quickly resolve any issues that arise. Thanks for your further note about the way that chainup information is displayed. I will forward your suggestion and comments to our people responsible for posting and displaying that information, for their consideration. What is the CMV weight based on? We have a flat deck truck with a GVW of about 8,863 kg and a combination weight of around 17,500 kg for the truck and one trailer. With these rules do I not need to put on steel chains if I have winter tires on when I am not pulling a trailer, and need to use four sets of chains when pulling the trailer (the truck is a single axle dually). Thanks. We have sent your question to the folks in the CVSE. Stay tuned. Here’s what we heard. The new chain up regulation refers to the truck itself, so trucks weighing between 5,000 kg and 11,794 kg LGVW must carry chains or acceptable traction devices, unless the vehicle is equipped with winter rated tires with the 3-peaked mountain and snowflake symbol or the M+S symbol. Commercial vehicles 11,794 kg LGVW and greater, such as tractor trailers, are required to carry steel chains on most major highways. It sounds like you fall in between the 5,000kg and 11,794kg LGVW category for your truck. Thanks. That was the clarification I was looking for. Glad to hear it Cody! Thank you very much, I really do appreciate the fact that I have been carrying alternative traction devices for more than three years now, approved by British Columbia. My autosocks which were approved up until this update have never ever left me stuck anywhere. it’s a quick 5 minutes out of the truck all four exterior Drive tires done all my axles locked up, and then up the hill I go with absolutely no slippage of the sort. So I really do appreciate you guys updating the law and making it illegal for me to even travel in your province without having to install costly chain hangers, and buy steel chains just to never throw them due to lower back problems. I would strongly recommend you guys looking into approved alternatives meeting certain conditions. As I have mentioned my alternative traction devices have never left me sitting anywhere and I normally gross 46500 kgs. I would also take the moment to add that a traction device approved literally everywhere else should be more than adequate, especially considering some of the locations they are approved received more snowfall then the Coquihalla. What you have is an issue with driver training. I do have a question though, are you guys looking to reinstate the use of certain approved alternatives? Or is this a non-compromisable update? We have sent your question about alternative options to our staff for review. Stay tuned. First of all, thank you for improving the chaining up for the steep hill above the snowshed. Will be nice to see people puting on adequate chains… or any chains for that matter… to climb the pathetically maintained snowshed hill. You are indeed to be congratulated for punishing the taxpaying drivers of BC for the shortcomings of the private, for profit contractor who has been “caught unaware” by so many snowstorms that were forcast days in advance. However, I would like to say thank you to the ministry for exposing me to potentially fatal conditions on the rest of the undermaintained highway 5. The company I work for actually cares about us drivers and as such, all of our highway tractors have come equipped with automatic chaining devices on both drive axles and winter/snow rated tires. For the past several years, there has been only one or two occasions where we have not made it up snowshed hill using those automatic chains on our A-train configued units. Those occasions were due only to failures of other systems and not the automatic chains. The exposure to fatal danger is when climbing other hills along the Coquahalla and/or the Okanogan Connector where chainups are not manditory and no chainup area is provided. If those hills… Larson Hill, Comstock Hill, Hamilton Hill, and the 2 hills climbing out of Kamloops and Kelowna… are icy and require that chains be used for assistance, I now have to exit my cab onto a highway occupied by other vehicles and risk my life puting chains on by tractor manually. I understand the need to have more effective chaining with the ever decreasing quality of the road maintenance, but why can’t a compromise not be reached in this? Why can’t a set of single chains be applied to all 4 outer drive tires and the automatic chains on both axles be required to provide traction to the inner tires? This would mean that all 8 tires would have coverage and that has to be as effective as having 6 tires covered with conventional chains. I’m hopeful of a timely response to my queries. Hopefully I am not disappointed. Hello Brian and thank you for your comment and question. We shared your concern with our local area staff and they confirmed that these chain up regulations are for mandatory chain up facilities. For locations without a sign requiring you to chain up, it is up to the discretion of the driver what they do in order to safely travel the road: automatic chains might work great in those locations. For the mandatory chain up sites, when required by signs to chain up, you must meet the regulations. We found that automatic chains can be effective; however, if the truck loses momentum or has to stop on the grade, automatic chains aren’t effective for backing or starting from a stop. We hope that this helps answer your question – thanks again for connecting with us here. 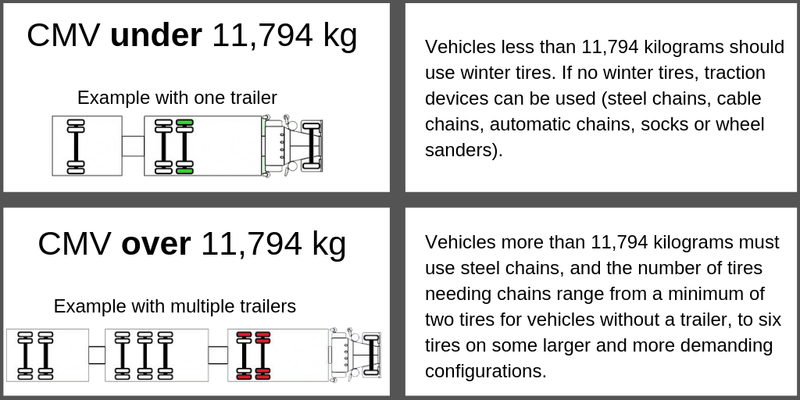 Will a motorcoach (without trailer) which weighs more than 11794 kg be required to carry and apply steel chains only, or will they be able to use winter tires and alternate traction devices such as cable chains, socks etc? Hello again Eric – we’ve had the following information further clarified in regards to your question. The regulatory sign displayed above speaks about licensed gross vehicle weight, while your press releases only mention vehicles over or under 11,794 kg. Do these new regulations apply to the licensed gross vehicle weight of the vehicle, or the actual weight of the vehicle? This should be clarified on press releases to avoid confusion for drivers. Hi Trevor. Sorry for the confusion. The regulations apply to the licensed gross vehicle weight. Thank you for clarifying most configurations. What about B-train’s with A tri-drive tractor pulling two trailers. Hello Mark – the minimum requirement for a B-train with a tri-drive tractor pulling two trailers is the same as the requirement for a B-train with double drive tractor. Thanks for your question! Why the emphasis on the front drive axle? Hi Sean. Just make sure the chains go on a drive axle, and are evenly spaced on each side of the truck. We recommend the configuration shown in the graphic because the front will chew up the compact and create a rough surface for the subsequent tires. Depending on weight distribution, however, some drivers may prefer to put them on the very back drive axles. Why do you recommend the front drive tires be chained first? This is a mystery to me as the rear drive axle is the primary drive and gives the majority of the grip on the road. Also i would like to mention that the damage caused by chains having a failure or breaking on the first axle is entirely more damaging to the equipment and much more difficult for the driver to install and uninstall. Hi Dennis. As long as the chains go on a drive axle, and are evenly spaced on each side of the truck, the configuration is acceptable. We recommend the configuration shown in the graphic because the front will chew up the compact and create a rough surface for the subsequent tires. Depending on weight distribution, however, some drivers may prefer to put them on the back drive axles. Out of those 41 closures how many were caused by a super b unit? Also out of those 41 closures how many times was it poor maintenance? Why is a super b unit (63,500) not required to run 2 sets of triples? I drive these roads everyday for almost 40 years and this is mind boggling!!!!!!! We have sent your question forward for review. Stay tuned. Sorry, we don’t have hard statistics on vehicle configurations. With the requirements, we have attempted to match typical configuration complexity. Those noted here are minimum requirements. You failed to answer Bob Kitsul’s question on the statistic of how many of the 41 closures were due to poor maintenance. Hello Brian and sorry about that Bob! We closely monitor our contractors performance, can confirm that the contractor is meeting our specifications and have been very comfortable with the level of maintenance provided on this stretch of highway. The Coquihalla has a Class A classification, with a current maximum allowable accumulation of 4 cm for the first lane of a multi-lane highway, the second lane is allowed a maximum of 8cm and the third lane a maximum of 12cm . This is a consistent provincial standard requirement for this classification of highway. We are currently in the process of renewing our maintenance contracts in all of our 28 service areas across the province and under the new contracts; the Coquihalla highway will have an enhanced maintenance standard with a maximum allowable accumulation of 4cm on all lanes. We hope that this helps answer your questions. Please let us know if you have any further questions. Thanks. You still haven’t answered his question. All you managed to saying is that you have specifications, that are actually horrible I might add that your contractor meets. Good for him someone give him a round of applause. It’s still doesn’t address the question of how many of those incidents were caused due to bad road maintenance. Let’s take a look at your counterpart in the United States who will actually close the highway to clear the road. So could you please answer his question now.